Obviously this report is specifically about the nursing industry. But I am sure these feelings are not exclusive to this group. I bet we have all had that experience of having to do extra to cover for colleagues that either cannot or choose not to do their job well. So should you fire the ineffective ones to keep the great ones? Well, my first instinct would be yes. Obviously, you would try and develop these individuals but there are some skills that cannot be taught. Thinking of nurses, the values of empathy and responsibility that make the great nurse shine cannot just be switched on in others if they are not already there. I had a boss that was very clear with his team that their direct reports should all be A or B players. C players should go to make room for another A or B. But it is not always that simple, is it? It is common knowledge that the nursing industry is crippled with staff shortages. And again, it is not the only industry struggling with that. The A and B players aren’t sitting around waiting for your call. So it becomes a vicious circle. Great employees are leaving. This leaves a big hole (and of course the hole is bigger when you lose the good ones). The ratio of good staff to ineffective ones is not going in the right direction. But you feel you have no option but to keep hold of the ones you have – no matter how mediocre they are – because you have to keep the doors open of your organization somehow. Would you get rid of the ineffective employees? On paper it is an easy decision. We all want the best people. But, when you are struggling to find anyone to fill the open positions you have, the decision is not so black and white. You have to have a plan. You should get rid of the deadwood. If you can’t do that immediately then you should know when you will be able to. Many healthcare organizations point to the shortage as the key reason they cannot attract nurses to their organization (“There just aren’t enough”). But imagine if the nurses in a hospital felt so positive about their workplace that they told other nurses, “Come work at my hospital”? Or even “You should consider nursing as a profession, and then come work at my hospital”? Talk to your good staff and find out how you can make it a better place to work. What would make them encourage people to join? Then put as many of those changes in place as you can. And be very vocal with your people about what you are doing. Get them excited about the changes so they start telling people now. You don’t have to wait months for those changes to embed themselves. Hire the right people. No more C players. Hire for talent. Make sure they have the values you know make for great employees in your business. Plan out when you can move on the ineffective team members you already have. Do it as soon as you can. You need a game plan. Know who you need to move on and what you need in place to make it happen. 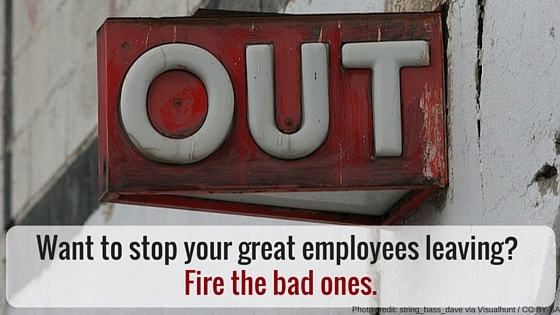 Bad staff are not only responsible for pushing out your good staff. They slow your organization down. They are your representatives – your people are a major part of how your organization is judged. Think about the horrific customer service stories people share. And in examples like this – we are talking about patient care. This is when it gets serious.